Cleaning and scrubbing can wait till tomorrow. For babies grow up we’ve learned to our sorrow. So, quiet down cobwebs, dust go to sleep. Hello, I found your website by searching for this poem. I’m trying to purchase a few of these exact stiched pictures for my sisters and I. My mom had one hanging in her room when we were kids. Do you know anywhere where I can find one? I am delighted to see this image on your site! My Grandma, who passed away when I was four, had cross stitched this pattern for my mother. We moved a lot during my childhood– I grew up in twelve different houses– and the picture managed to stay with us until a few years ago. On a whim, I thought I would try to locate it on the internet– I did– on your page! The image instantly takes me back to my childhood. Do you have any idea how I could replicate it? By the way, that’s such a neat memory that you have of this picture. Does your mother still have it? I’m just now realizing this is missing from my mother’s house. It was a cross-stitch done by my grandmother. That’s sad. My mother did this one. I always loved this poem growing up. I stitched this when I was expecting my first child. She’s all grown now and expecting her first. This sure brings back memories. I made this when my children were babies. I’m awaiting the birth of my first Grandchild….guess I better get it out and put it up again. Thanks for the memory! I, too, stitched this when I was expecting my first child in 1978. Now I am awaiting the birth of my 3rd and 4th grandchildren……and I can’t find my needlework!! Does anyone know where I can purchase another pattern just like this one? Where can I find this pattern? I’ve been trying to find it for years! Thanx. I wish I could tell you. I’m hoping to convert the one my mom had that she used to make this to a digital format so people can get it again. I’ve had several people ask me. If I ever get to it I’ll be sure and let you know. Can the cleaning and scrubbing embroidery kit be purchased?? Not at this time. I have plans to hopefully have at pattern available for purchase at some point. I did this picture for my first grandbaby and may still have the graph. If I do and it isn’t copyrighted, I would be happy to share it. I stitched this exact picture when I was expecting my first daughter in 1979. When I moved I downsized and gave this item away. I have been regretting this action ever since!!! Now my daughter just had her first son (and my first grandbaby), and I would so love to stitch this very item again for my daughter. It is the exact one I lovingly stitched way back when. HELP!!! I hope you can get a handle on where all of us who love this very same embroidery can purchase it. Thanks so much in advance for any assistance you can give all of us in purchasing this embroidery kit. I recently found this embroidery piece that my mother-in-law made when our second son was born in 1987. He and his wife our now expecting their first child and we are passing it on to him. On the back she included the poem from which it was taken. For anyone interested………. 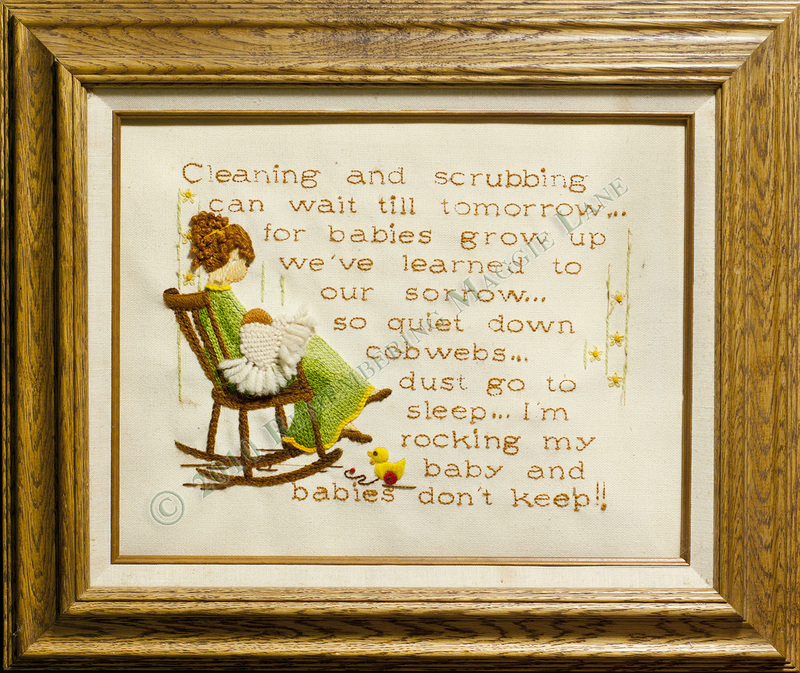 The verse used in “Babies Don’t Keep” has been adapted from the following copyrighted poem by Ruth Hulburt Hamilton which first appeared in the Ladies’ Home Journal in October 1958. (Pat-a-cake, darling and peek, peekaboo). Hope you all enjoy this wonderful poem. Seems like there is a lot of interest in making this kit available again. Maybe some company will see the need and produce it again. It is so meaningful!!! i am looking for this too.. i would love to embroider it for my sister. its such a lovely poem. Will let you know when I have something available. I am also interested in this cleaning and scrubbing embroidery kit. Is it in stock yet? I started cross-stitching this exact picture for my little baby boy’s room when he was just 9 months old. I gave up on it because I was so slow doing it. I kept it safe down through the years. I took it out again 26 years later and finished it for my son’s little daughter. It’s still hanging in her bedroom and she’s 10 years old now. Awww. How sweet. That’s so special that you finished it. Good work. That will be a nice memento for them. Now that it is November, 2015, is the Cleaning and Scrubbing embroidery kit avaliable for purchase yet? Hi. Just has a baby in November. She was in the NICU for a while so the rest of life had to stop. Just getting back to things. I am looking for the scrubbing and cleaning embroidery kit available for purchase yet? We’re u can buy this one? I haven’t found a place yet. I’m going to try to see if my mom has her old pattern or try to convert her needlepoint to a pattern. I sure hope someone finds a “reasonably” priced version on this saying for all of you stitchers! I looked online and only found others willing to share their already completed versions, and they were $94.00! Yikes! Maybe look for it at a craft site like “Herrschners.com.” I’ve looked, but haven’t found a pattern like the one shown above. It’s my favorite. I found one with just words, but it lacked the personal touch of the mom in the rocker one! Thanks for the info Tammy. I’m still hoping to get a pattern to share as well if I can find it from what my mom has.